Iceland's Golden Circle route is the ultimate day trip destination from Reykjavik—although not too far from the city, the route features some of the country’s must-see geysers and waterfalls. Here’s how to tour the Golden Circle from Reykjavik. Tours leave Reykjavik regularly, with guides on hand to lead travelers directly to the route's key sites, including the UNESCO World Heritage–listed Thingvellir National Park, widely considered home to Iceland's most impressive natural attractions. 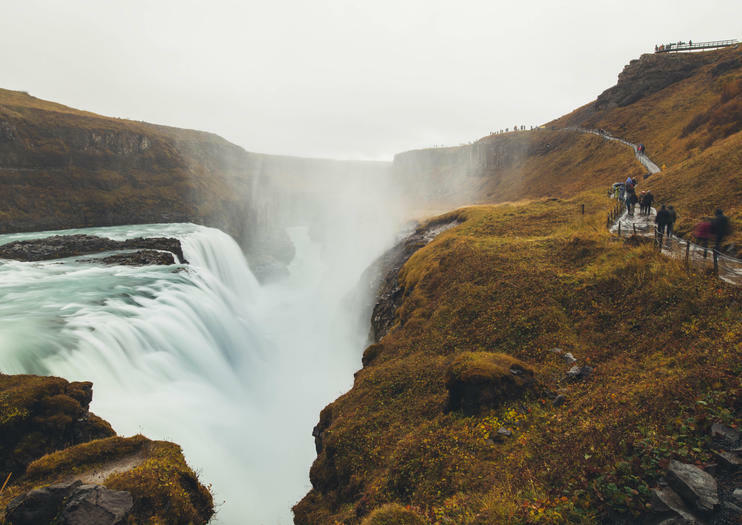 Travel by road or take to the skies by helicopter with a guide, and discover famous Golden Circle staples such as Gullfoss waterfall, the geothermal pools and Strokkur waterspout at Geysir, and the tectonic rift in the Thingvellir National Park. Combo tours are an ideal way to double up on the adventure, and squeeze more into your time in Iceland. Choose a tour that takes you around the Golden Circle's top spots and also includes a trip to the Hvítá River for a white-water rafting adventure; to the Blue Lagoon or Laugarvatn Fontana Geothermal Baths for a soak; or to Langjokull Glacier for some winter sports. Express Golden Circle tours from Reykjavik run at about eight hours, and more comprehensive combo tours can be upwards of 11, so prepare for a full day. From Reykjavik, the furthest point on the Golden Circle tour is the Gulfoss waterfall. This natural landmark lies 67 miles (109 km) away from the city—a drive of about 1.5 hours. Iceland's otherworldy landscapes come with unpredictable weather and rugged terrain, so pack accordingly. At a minimum in winter, you’ll need a fleece layer, a warm, waterproof coat, thermals, and a hat and scarf, plus warm socks and gloves. In summer, wear thinner layers that can be easily removed and packed away if the sun comes out. And don’t forget hiking boots for the trekking trails or swimwear for the thermal baths.